Public Transit Benefits - Ardent Solutions, Inc.
1.1 million jobs are created or sustained annually. 50,000 jobs result from the productivity gains of $1 billion in federal investment. $66 billion in business sales are generated each year. Public transportation is a $57 billion industry that puts people to work – directly employing nearly 400,000 people and creating hundreds of thousands of private-sector jobs. $9.5 billion in local, state, and federal tax revenue are generated each year. 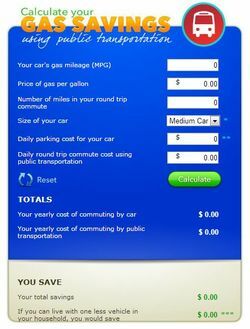 Calculate how much money you can save by taking public transportation instead of driving. By linking on the Fuel Savings Calculator below, you may set variables for the price of gas and the length of your regular round trip to match the current price of gas in your community and the number of miles your typically drive. Calculate Your Carbon Reduction by Taking Public Transportation Instead of Driving. Click on the calculator below to estimate the potential reduction of carbon dioxide emissions you can achieve by switching part or all of your travel to public transportation.